The large hose is the intake to (driver side) valve cover connection. The connector at the top of the pic attaches to the intake. Apparently the new cover does not have a PVC valve integral to the cover such as the original cover does. Upon startup after installing the new cover there is a huge vacumn on the crankcase. 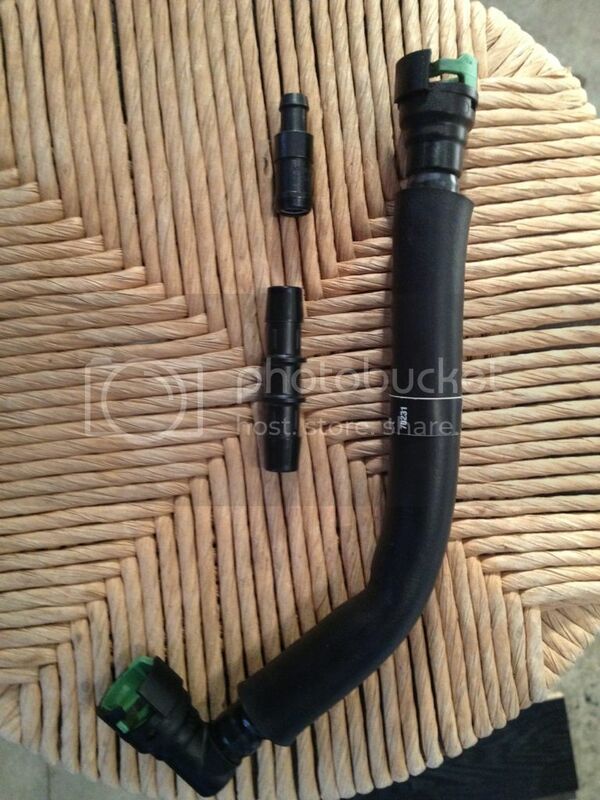 Checking the parts provided with the new covers, I see that there is a PCV valve and a hose connector (pictured). I am assuming that I am supposed to cut into this hose, insert the new PCV valve and then reconnect the hose. Is this correct? I would call SAI mod shop. I doubt if anyone that just answers the phones for selling parts would know. But please let us know. The plastic coupler and PCV valve is installed on the driver’s side of the engine. The plastic coupler is cut and then pressed onto the end of the provided valve. The assembly then goes in line between the intake fitting and the fitting on the cover. See pix attached below. A PDF document of these instructions will be uploaded here shortly, and included in the box going forward. Sorry for any inconvenience! It's kinda funny, I bought a set for myself, but have not found the time to install them. Once I put them on, I'll upload photos... they are GORGEOUS. Richard, I have a thread running on an install, with pics - I was held up waiting on this answer and hope to resume today or tomorrow. These valve covers are beautiful. Since this is a valve cover question thread, I'll throw in a comment about what we talked about thursday concerning the Shelby GT valve covers. I'm going to hold off on buying any until you check the viability of doing blue ones. Thanks again for a great day!! Hope I didn't miss it but I was looking for the pdf? Buy the Ford Racing ones, I love mine!!!! This is only for the "race fab" covers... do you have a set? We actually have a whole new set of more-detailed instructions coming early next week, they will be in the box from now on along with additional parts to speed installation. Yes I do. I've had them for several months. I'm planning on installing them next week. Jer knows what I'm after, don't ya? I show your order for the black powdercoated Shelby covers, not the "race fab" model. Regardless, I'll make sure to post that PDF for the "race fab" model ASAP. Thanks! I did have the black ones. I sold them to another TS member and purchased the race versions through Champion. OK, now I get it. Thanks for clarifying - I don't mean to run you around, just want to get you the right info. I will make sure you get the new sheet, should have it any day now. Send me an email at JerG@ShelbyAmerican.com and I'll send you the latest pix and instructions info in a less-glamorous form. No sweat. I appriciate your help. Email incoming soon. Sorry Jer I did not mean to step on toes if Blue Shelby ones were coming out, just an option if they were not. Well, Yoggiebhr visited SA last week, and I told him I'd look into it. Got your email, did you get the info I sent you? Yea Jer, he sold those to another TS member! Extra hose being shipped out to Dwain and Bob for their sets, and will now be included in kits, along with PDF instructions. Man you are awesome. Thanks a bunch!!! You're welcome. Post pix once they're installed! Excellent; thanks again. If I get that in time ill finish up this weekend! If the weather cooperates I may even be able to take the new covers and mufflers on a test drive! Looking forward to your review of the mufflers! Jer, any luck with that pdf? If it was in the box you sent, sorry i havent opened it. I'm waiting for the "pretty" pdf before I finish.....I don't want to miss doing anything exactly as the instructions show.